I’m an optimist, as I think most translators naturally are. On what is my optimism founded? Well, among other things… I’m spending these few months reading through a very, very large pile of translated novels—as I’ve mentioned before, I’m judging the Man Booker International Prize—and everything about this massive pile suggests that in the Anglophone world things are looking up for translated fiction. There isn’t enough linguistic diversity, to be sure, but there’s more than there was; there should be more submissions, but there are more than there used to be (and as the guy who has to read them all, well, it feels like plenty as is, thank you very much…); no, there still aren’t enough publishers taking a risk on certain kinds of foreign books, but here again, there are more than they were, and I think most are doing it better (both the limited number of corporate imprints and the ever-growing army of intrepid small indies). And most fundamentally quality of the work is exceptionally high, both the originals being acquired and the translation work brought to bear on them (insofar as I can assess these things separately at all). So many good writers, so many good translators—and they aren’t going away anytime soon, either. Sure, exactly how much gets translated, and what kinds of things are translated, and how they’re received, all these things will shift over time like tides; the swell of Scandinavian crime might subside and something else will rise, a different language might produce an unexpected bestseller. And when that happens, just as, say, Swedish-to-English translators recently did, the rest of us translators will just have to think slightly differently about what exactly we’re comfortable translating. (I’ve long been keen to get more children’s books translated into English, for example, a trend that hasn’t yet caught. If that does change, it’ll mean a lot of translators who’ve never done these things before will have to learn. Excellent.) And yes, some of the things we’re asked to do will still be difficult, which is always fun. And yes, some will still be downright impossible, and we will of course do those, too. Translators will become increasingly influential in the decisions about what does get published, I’m certain of that. But recent shifts towards self-publishing will affect our part of the business less than the rest, or at least more gradually, so even a decade hence we’ll still be working with professional publishers, our expert partners in the mission of getting books from over there into the hands of readers over here. And as relationships with publishers have improved over the years, as we’ve understood each other better, so that improvement will only continue. (OK, except just occasionally when it doesn’t.) I suspect there are some areas in which publishing habits in different cultures will begin to converge, which I sincerely hope includes editorial practices—the more inter-national the business becomes, and the more publishers all over the world have to fight to justify their presence to their writers, the easier it is to imagine that particular bit of progress. Imagine, a future in which we translators get to translate books that someone has actually bothered to edit already! A brave new world! And talking of brave new worlds, I wonder if one of the loaded questions ticking away quietly behind yours is a technological one—it’s hard to think of the future of translation without acknowledging the presence of machine translators, after all. They’ll make more of a difference—it’s hard to dispute that, I think—but I also think that’s fine: they excite me more than they alarm me. (I’ve already got into trouble in this column with some of my distinguished colleagues for suggesting that title credits for translators aren’t vital, so I might as well keep making myself unpopular…) Corpus-based machine translators are (by definition) getting rapidly better, and certainly more quickly than any of us humans are improving, try as we might. We know that the development of these programmes varies dramatically depending on language pair; but as someone who translates Spanish, Portuguese and French into English (i.e. the popular and easy ones), I have no doubt at all my work will be impacted sooner rather than later. Technologies and societies and markets change, but literary impulses don’t. The different-but-related impulses to write stories, or to disseminate stories, or to read others’ stories, these things don’t disappear just because we happen to be stuck in a divided country, or because we happen to be living under a philistine government, or because we happen to be in thrall to a challenging market. Ten years from now, the growth of ebooks in certain sectors may have accelerated again or slowed to a halt; ten years from now, we may have more books translated from Chinese and fewer from French, or more from Arabic and fewer from Spanish; Amazon’s place in the non-retail parts of the book world may be consolidated ten years from now, and copyright law might find itself under further threat, and…—but honestly, these things are mostly incidental. I don’t mean that they’re unimportant, and they will require lobbying interventions from anyone who can make them, but they’re incidental to what I think is the fundamental question that does not change over time: Why is literary translation interesting, and why does it matter? I hope my columns over this past year have gone some small way towards answering this. Thanks for reading. For more insights from Daniel, check out this compilation of our favorite bits of translation wisdom from his past columns. Ask a Translator: How do you judge translation contests? Ask a Translator: Why aren’t translator’s names on most book covers? 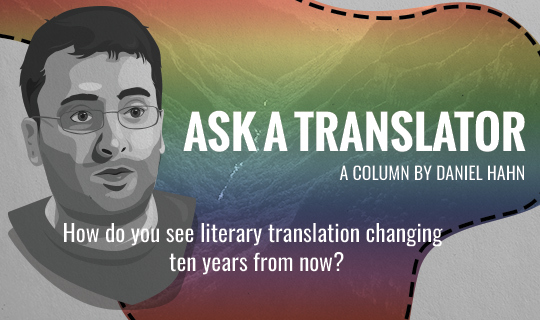 Ask a Translator: Should a translator edit a text he’s translating?